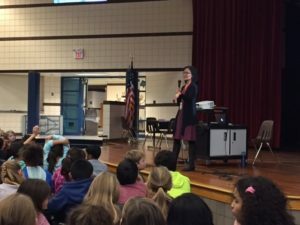 Earlier this month, I participated for two days in The Big Read Holland Area. Holland is located on the eastern shore of Lake Michigan. The first Europeans who settled there were — you guessed it — from the Netherlands. 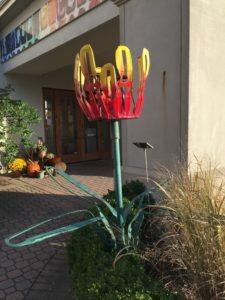 Holland’s nickname is “The Tulip City.” This whimsical sculpture by Stuart Padnos stands in front of the Holland Area Arts Council. My experience in Holland was simply powerful. Rarely does an experience resonate in so many ways: as a writer, former teacher, politically conscious citizen, and human being. 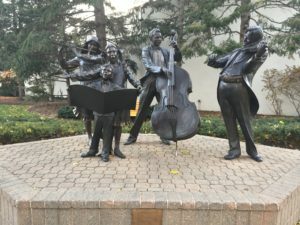 The Big Read, funded by the National Endowment for the Arts, is a program that provides grants annually to about 75 communities across America. Led by Associate Professor Deb Van Duinen of Hope College, Holland received its fourth consecutive grant this year. They’re doing something right! 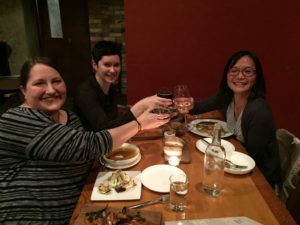 I had the joy of seeing a community putting NEA’s aim into action — particularly refreshing during this time of national turmoil. 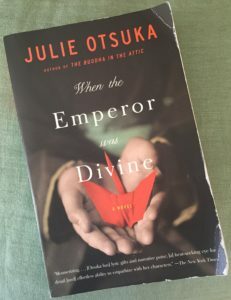 For this year’s Big Read, Holland chose Julie Otsuka’s When the Emperor Was Divine, a heartbreaking novel about a family’s experiences before, during, and after the Japanese American internment. 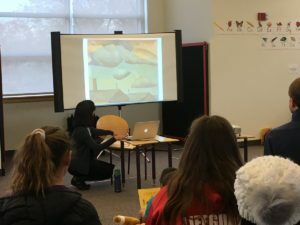 Built around this novel and the internment, Holland offered a month-long array of programs incorporating book clubs, lectures, visual arts, music, film, and so on. 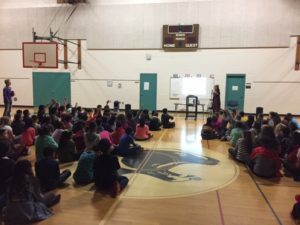 The Big Read is not just for adults! 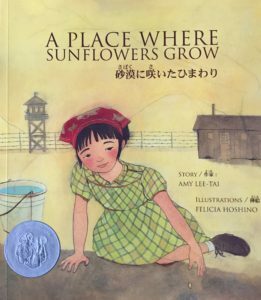 The committee chose my book, A Place Where Sunflowers Grow, so that kids would have an accessible book about the Japanese American internment. A committee member told me that 600-700 copies of my book were distributed in the community. Wow! What an honor to think that so many kids in Holland have my book in their hands. 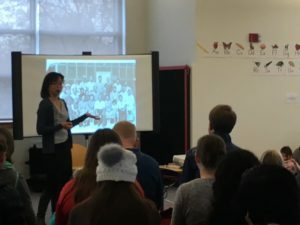 As you may imagine, the internment is a difficult subject to discuss with young people. The last thing I want to do, in my personal or professional life, is to crush a kid’s spirit. On the contrary, I try my best to lift up. 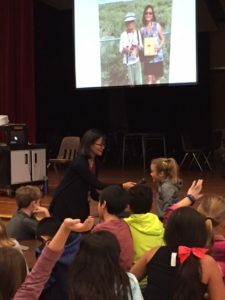 Whenever I share my book and give a program, I walk a fine line between educating kids about this dark chapter of American history and trying to inspire feelings of hope for their lives and our country. It feels like, and is, a tremendous responsibility. Why were there guns?” He was referring to the guards who pointed guns toward the internees from the watchtowers. 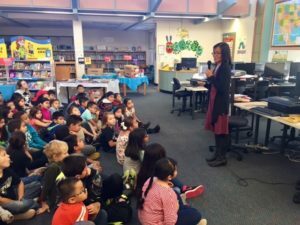 At the library and at the schools, I spoke with a total of about 600 kids. 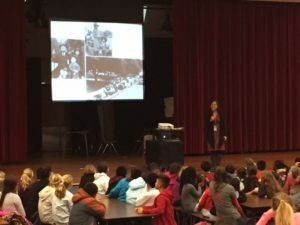 What an opportunity to reach so many young people about the internment! Yet my primary goal was to connect with them, in one way or another. I think that when we experience connections, it’s hard not to care about each other and the world. And I think that connections can also foster hope. Don’t we all need more hope these days? …and Felicia Hoshino’s illustrations which were, in part, inspired by my grandmother’s art. Do you see the girl in the red cape in both pieces? I asked kids to think about what it is they love doing and encouraged them to nurture that love. What brings you joy? What brings you peace? Their faces lit up and they were eager to share. Of course, I read and took questions. You never know what someone might connect with, and it was eye-opening to see the range of connections that students made during my visits. Still others focused on personal experience. 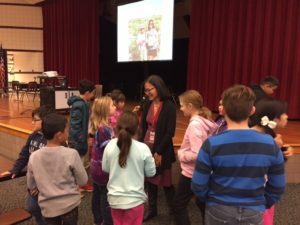 Between school visits, I heard that my book resonated with a student whose parent had been removed from home due to immigration issues. Then there was a question that cut through the weight of the subject matter and made me chuckle: How old were you during WWII? You gotta love kids! 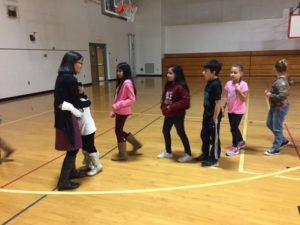 At one of the schools, I offered a high-five to students as they were filing out of the gym. I was surprised to be offered hug after hug. 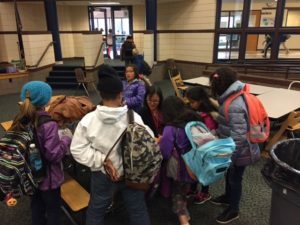 Ever mindful of physical boundaries, I repeatedly said, “You don’t have to hug me.” But many students chose to give a hug over a high-five. In addition to kids, I had the pleasure of connecting with adults in Holland. 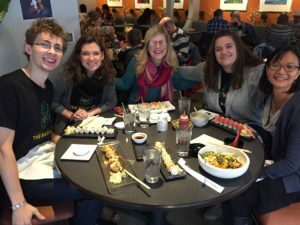 I shared a yummy lunch with Hope College students who serve on the college committee of The Big Read Holland Area. It’s a big operation (and even includes a high school committee). These bright students are getting it done! I also shared a long dinner with two wonderful librarians, Anne Harrison and Anne Pott, who serve on the main committee of The Big Read Holland Area. Dinner was scrumptious, the company lovely, and the conversation meaningful. 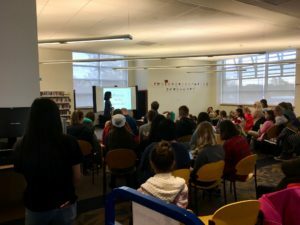 Could I love librarians more? 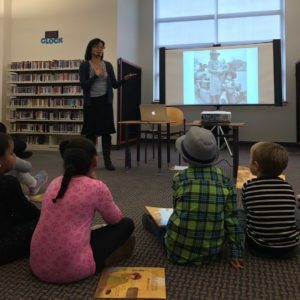 Authors and librarians (and teachers) share a special bond when it comes to books and kids. With Anne Pott (front) and Anne Harrison (back), celebrating The Big Read Holland Area. I asked the waitress for a menu to take home as a memento. 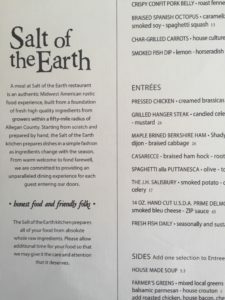 Salt of the Earth seemed like a fitting description of the evening and of my experience in Holland. I went to Holland hoping, most of all, to connect with people. I did and left with a renewed sense of hope — born of a community’s commitment to learning and growing, even when the conversation gets difficult. As with most things in life, going through the process can bring on something positive. 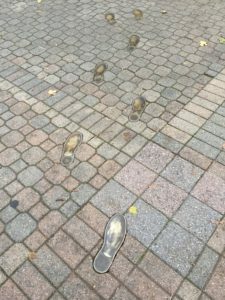 I found this downtown — footsteps leading up to an inspiring sculpture. The President aims to start shutting down the National Endowment for the Arts in 2018. NEA programs like The Big Read, which reach millions of Americans, would cease to exist. It’s hard to fathom the loss that this would cause in our country, both individually and collectively. Please click here to read about it and to speak up for the arts. 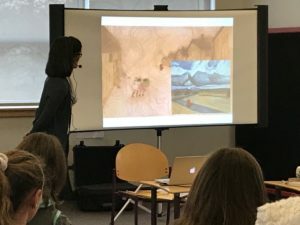 I often quote Kate DiCamillo: “Stories connect us.” I think the same goes for all of the arts. They have a way of sparking connections within and between people, sometimes in unexpected ways and in unexpected places. 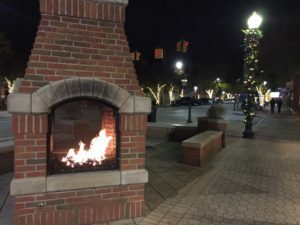 My first time spotting a fireplace on a sidewalk! Thank you, Holland, for your warm welcome. As 2017 comes to a close, I’ll remember my time there as one of the brightest spots of my year!